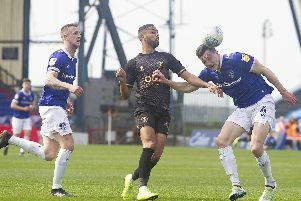 Mansfield Town chief executive Carolyn Radford said the club’s latest striker transfer target had the most impressive record of those chased so far this summer. She said at today’s AGM that she intends working on the deal with boss Steve Evans tonight and hopes it could even be concluded before the day is out. The possible deal came out the blue following a call to Evans from an agent first thing today. “We might know something by the end of the day,” she said. Chairman John Radford added: “We all know we need an extra striker. We need another option. “As you all know we are trying for promotion this season and really pushing for it. “Jim (financial director Beachill) is keeping my hands tied a little bit with players. But hopefully we’ll have some good news today or tomorrow. “Carolyn is working really hard for the club at the moment.